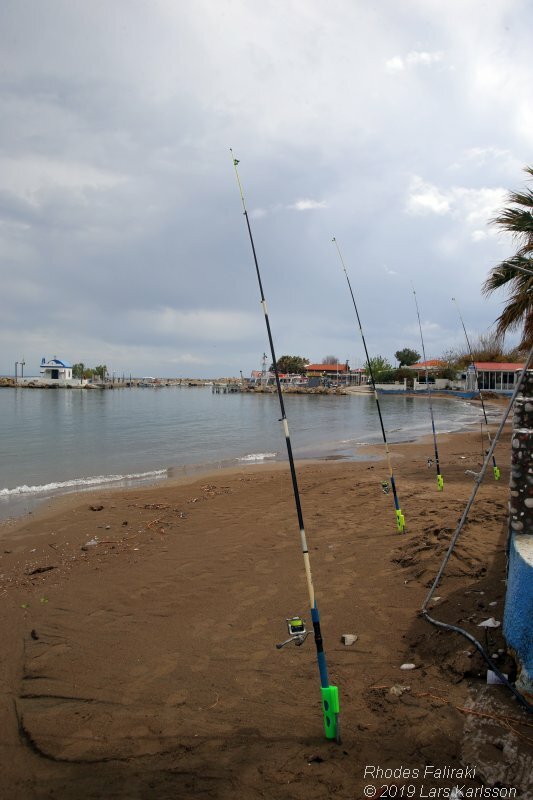 In April 2019 we had one week vacation at Rhodes, an island of Greece. 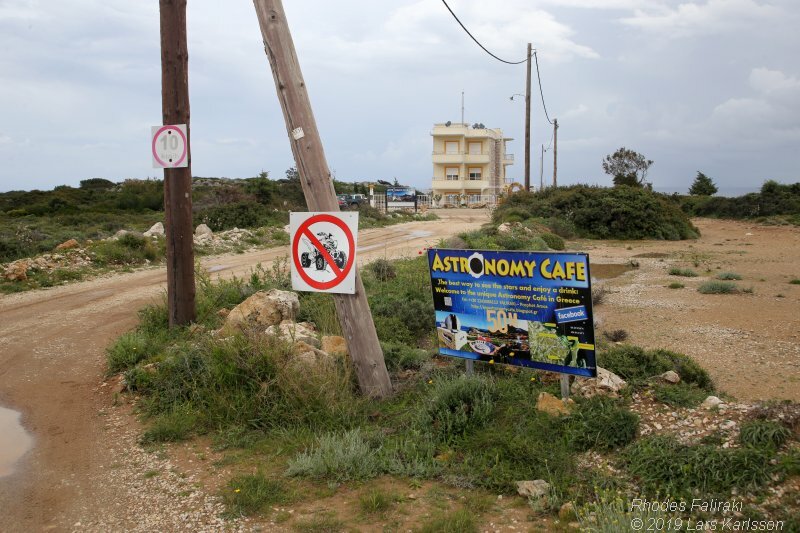 One week before we go I found that there is a private observatory at that island, the Hipparchos Astronomy Cafe. 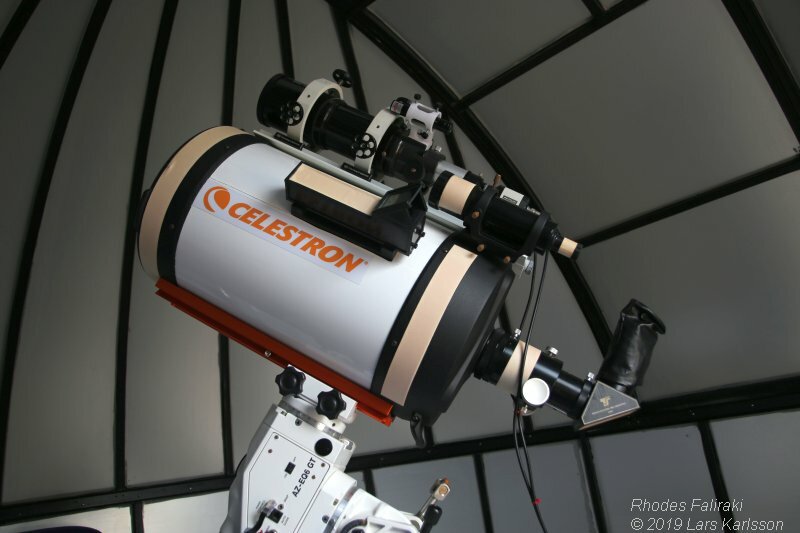 A place where you can stay and rent astronomy equipment. 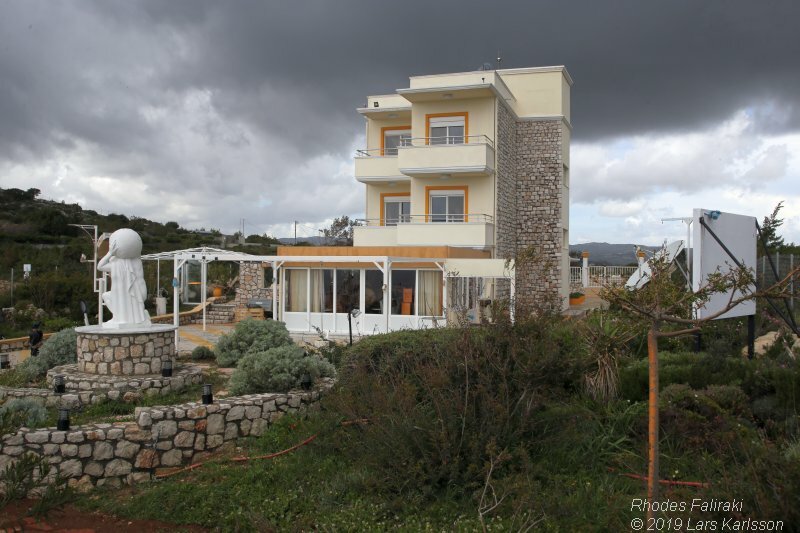 We had already booked our room in Rhodes town, but this place was just 10 kilometers south of Rhodes Town. Maybe we could go by bus and visit the place, we at least planned to do so. 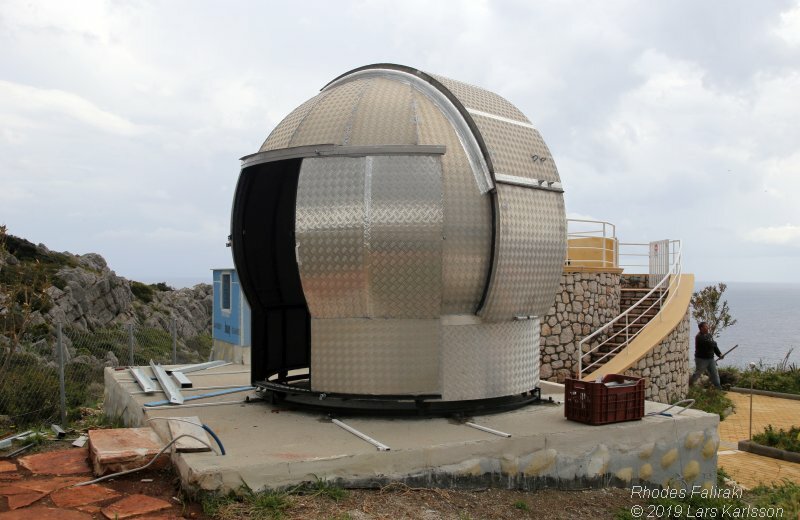 Down at Rhodes we found it was very easy to get to this observatory. Here we are on the bus from Rhodes Town and have just reached Faliraki. 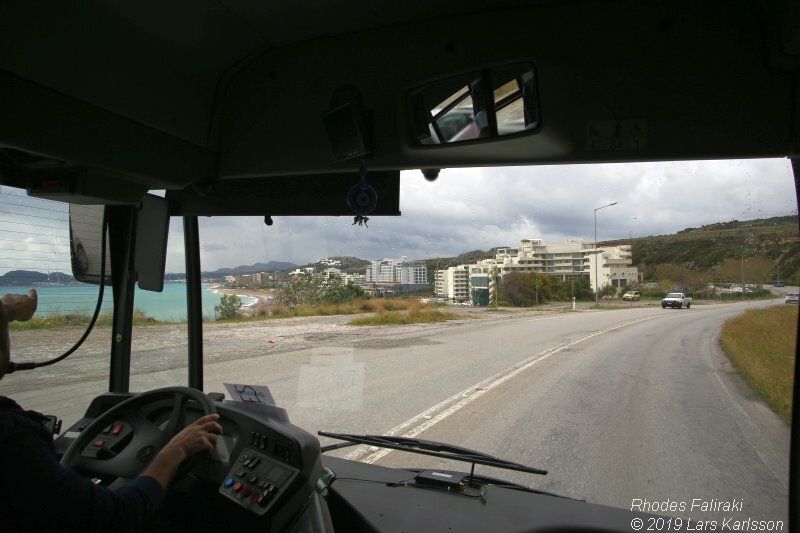 The bus driver explained for us that the end station is in the center of Faliraki close to the beach. Here we get of the bus, at the map we studied earlier we saw that there was a 2 km walk from here to the observatory. We didn't call the owner before because we were not sure that we come all the way to the observatory. We didn't take the shortest way, we followed the beautiful beach the first part. 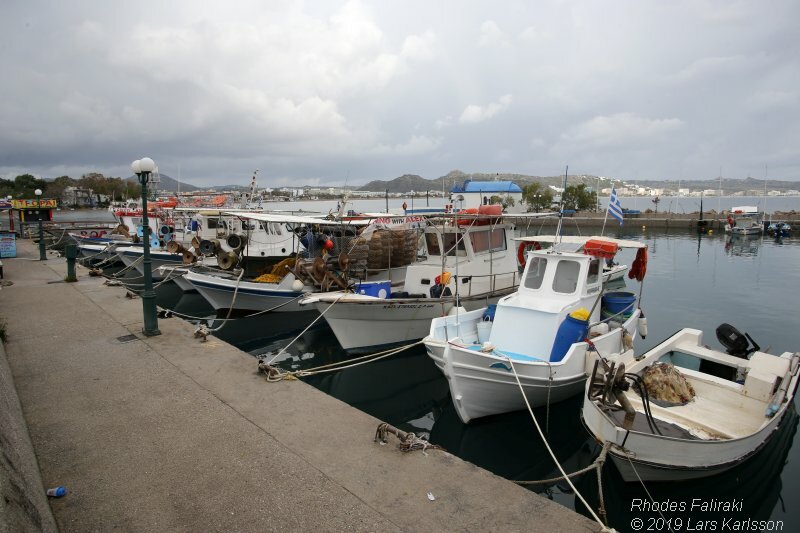 This is the old part of Faliraki and its harbor with its fishing boats. After the harbor we went up in the village and saw this sign about the observatory, we was on the right way. 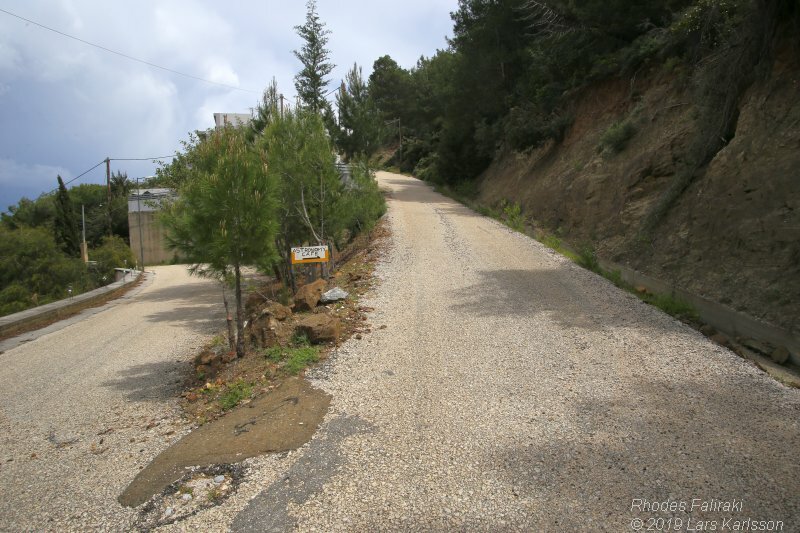 A steep road led us up to the hill. Halfway up we had this view over Faliraki. This was not a long walk and now we had the observatory in front of us, will it be open? No it was closed, but anyway we thought that we could have a outside view of it. When we come closer to the gate there were a man and a woman sitting there, they asked if we want to come in, of course we were. It was the owner Stergos and his wife who sit there. 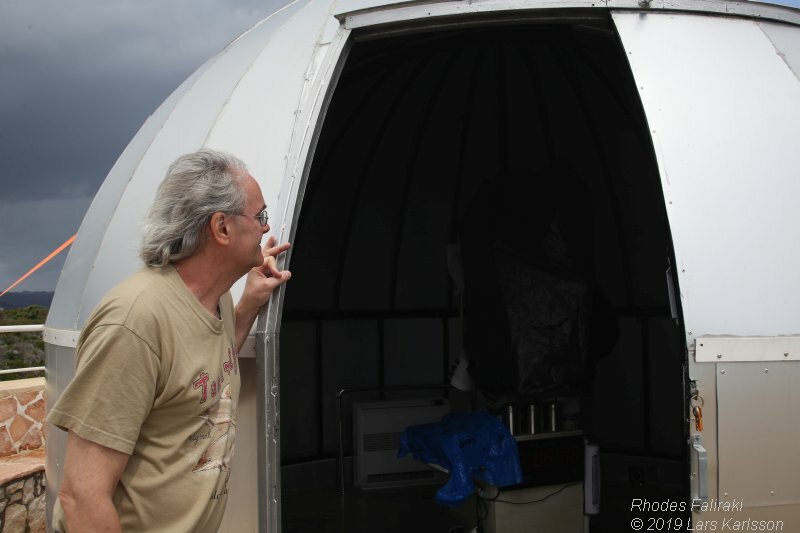 They use the summer to repair and rebuilding the observatory site. Busy but still they offer us a guided tour at the site. 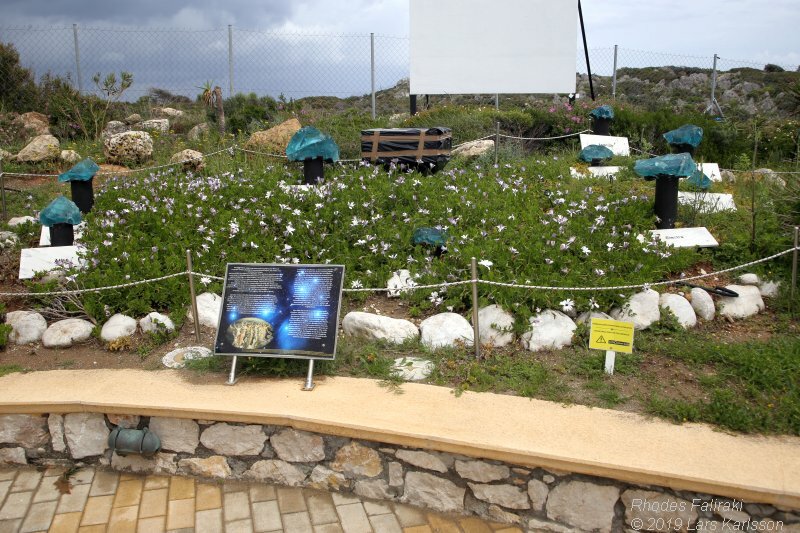 The observatory has also a park designed of the owners, here is the Seven Sisters or Pleiades, a star constellation and an open star cluster. 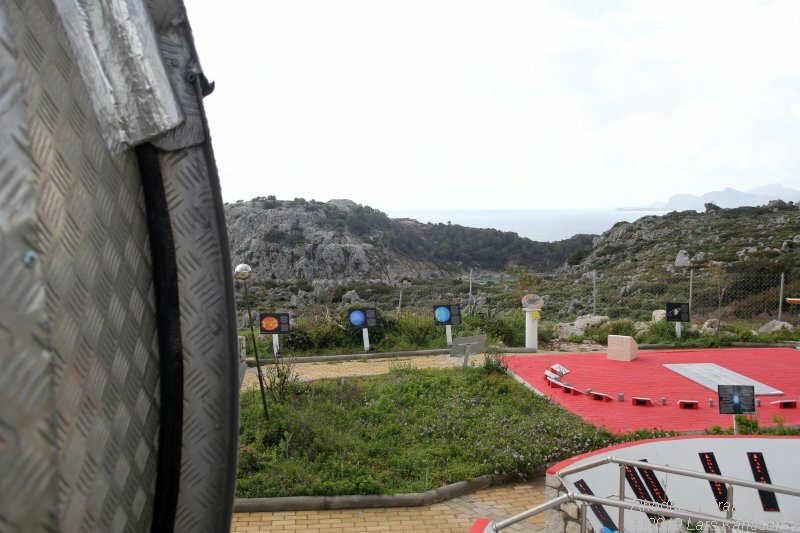 A view of the two observatories. It's very nice up here. Here I check the time with the solar clock, it says a quarter past twelve. You must stand at correct position of the white foundation, here I stand at the April mark. The clock doesn't work during the night. The big doom, what exiting things 's inside here I wonder. 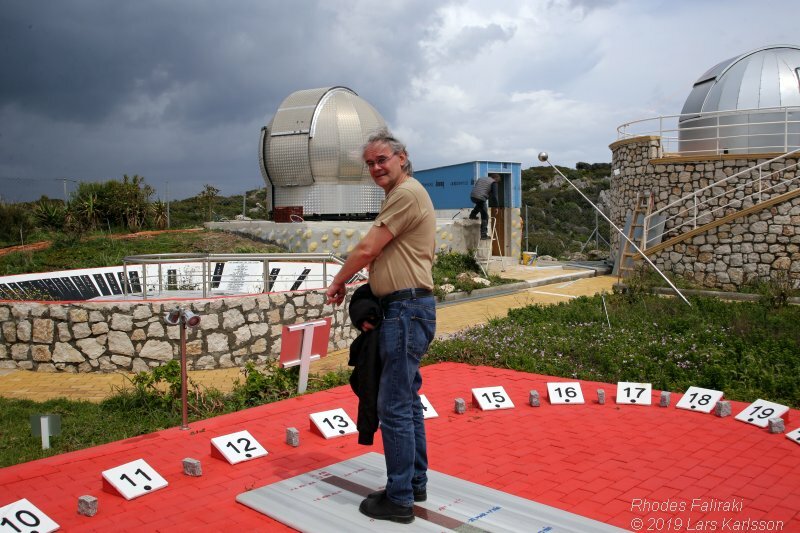 Stergos explain that here you find the 11" Schmidt Cassegrain telescope. It's mounted on a EQ6 mount. 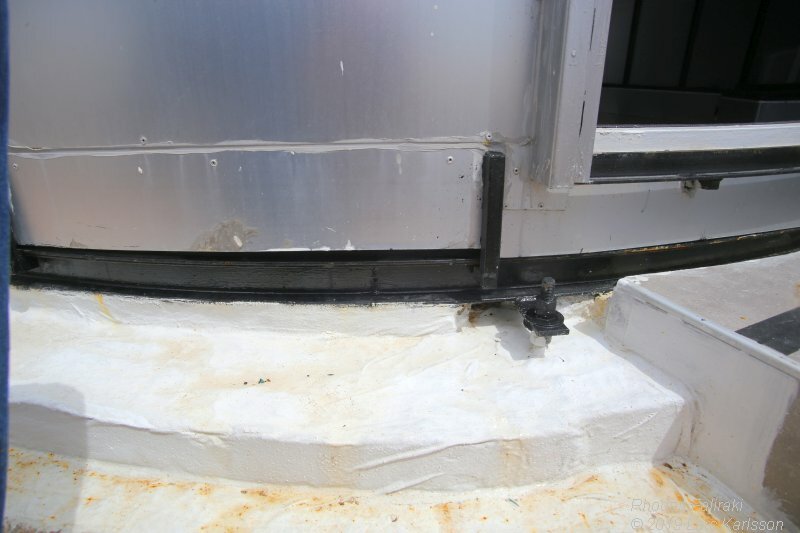 The doom is if his own construction, a garage door motor control the hatch. 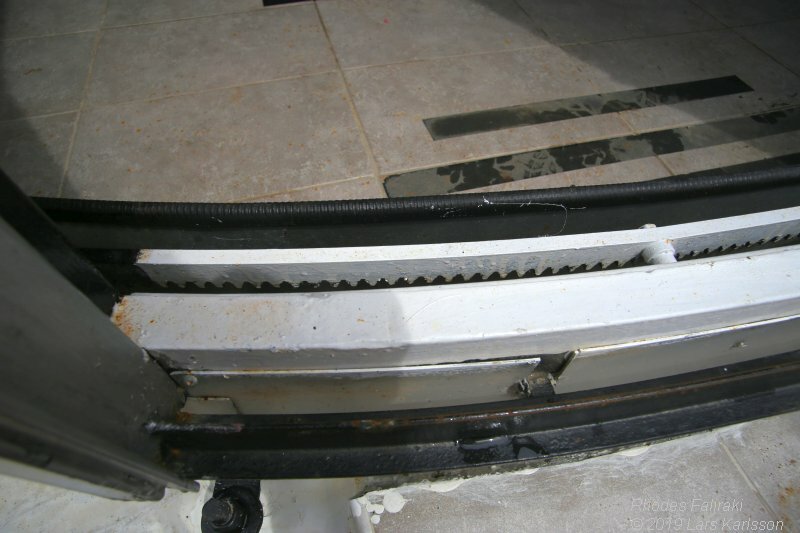 See the bent rack and pinion rod, the orange bar. Here is space for up to fiften people when they have guided tours. It can be very windy up here, the building that rotate to follow the stars is looked with these black L-shaped bars that are installed around the building. 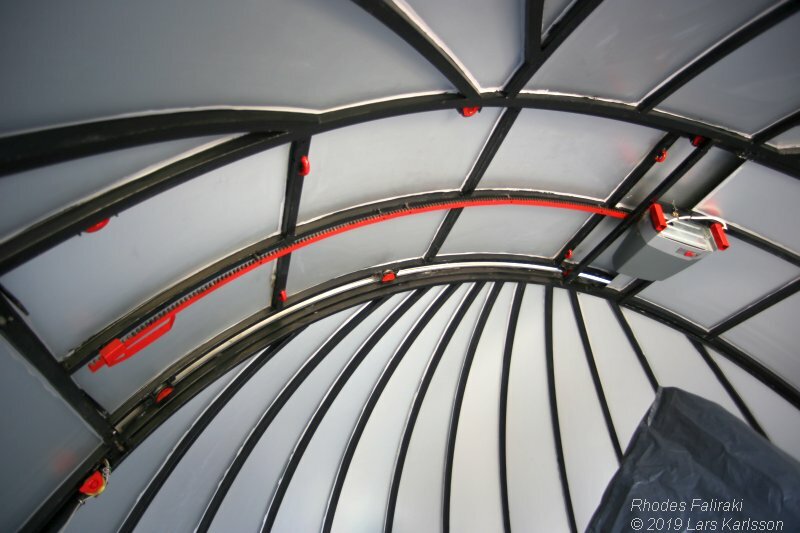 When not in use there are also other straps that look the building safely to the ground. To rotate the the building there is another motor that operate on this bent rack and pinion rod, it follow the building all around. 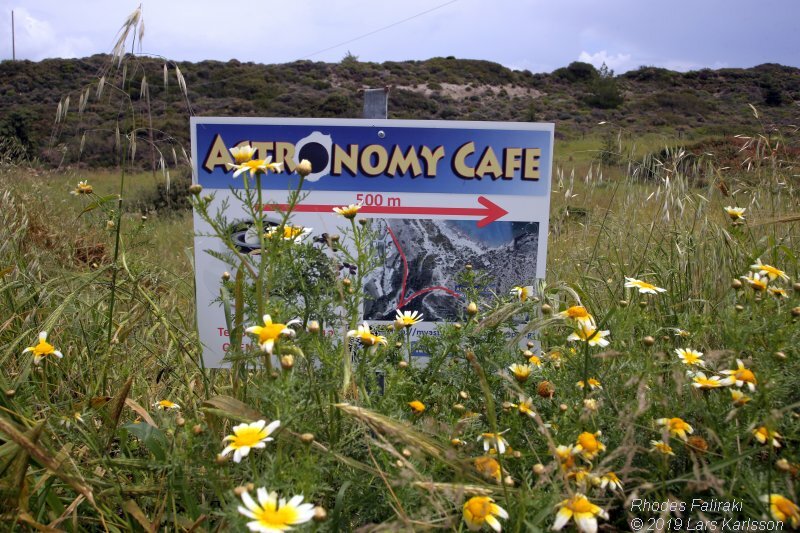 It's not only that you can rent telescopes and other equipment here, you can also stay here. 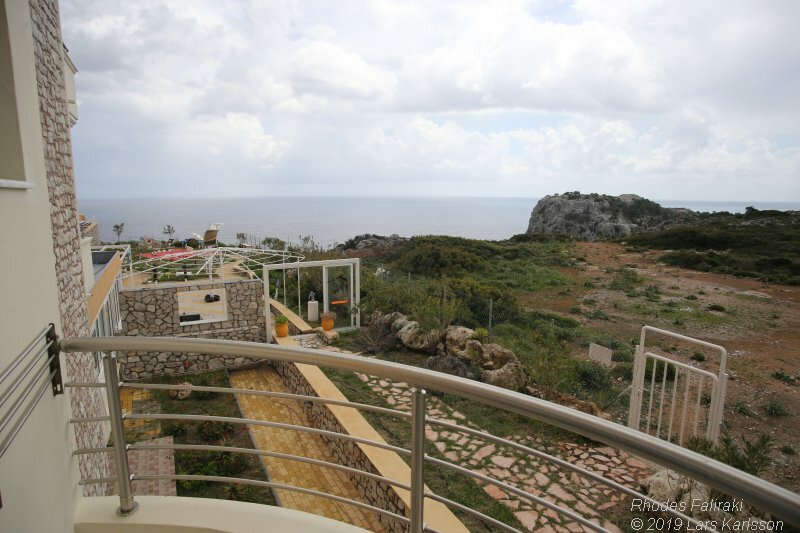 They can offer six rooms, double rooms and studios. 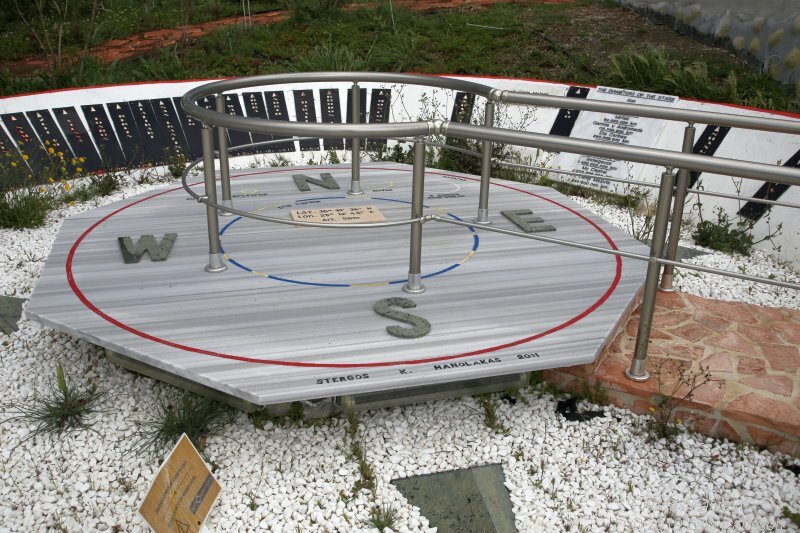 I forgot the use of this platform, but it had something to do with orientation of stars and the sizes of them. 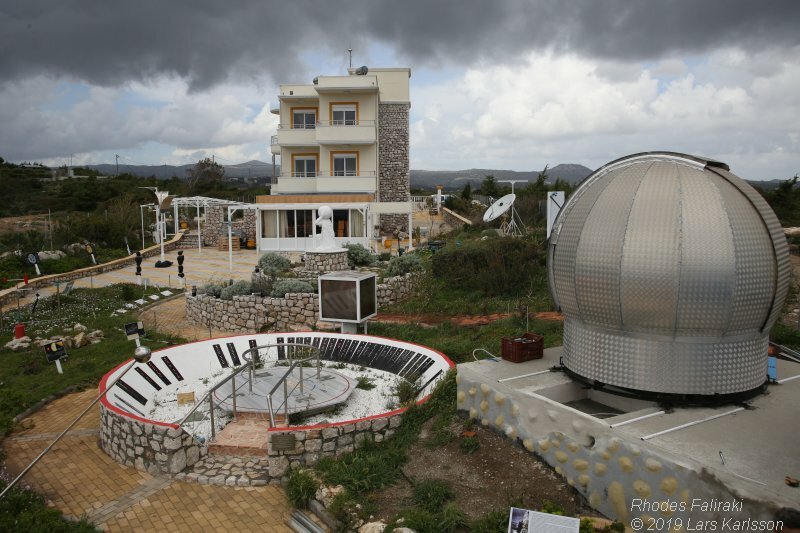 Here is the smaller observatory building. 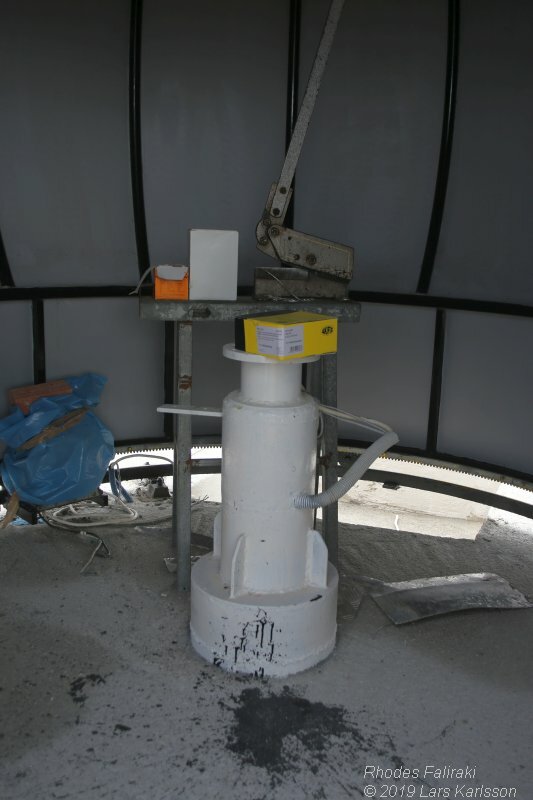 Even if it's smaller it will hold a bigger telescope, a 14" Schmidt Cassegrain. There is no need to be room for people here because it's remote controlled. 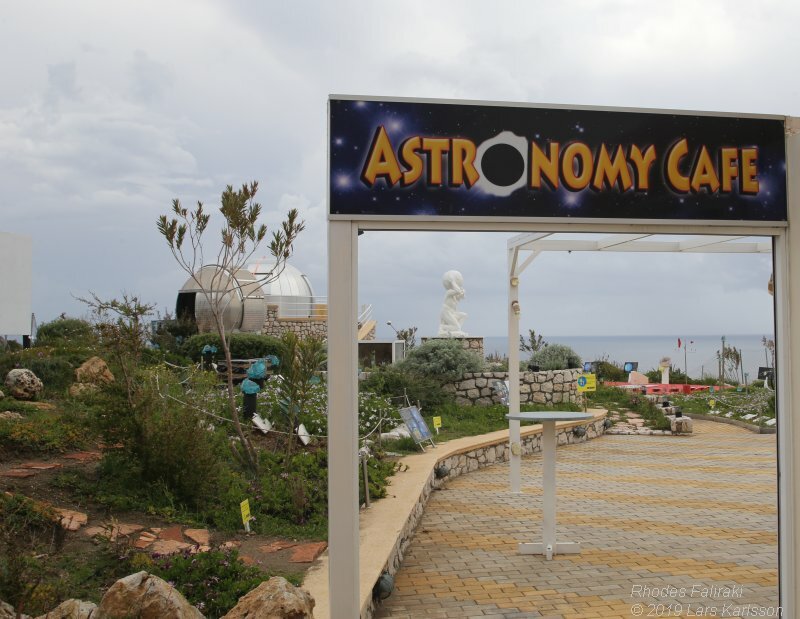 You don't have be a fanatic astronomer to love this place. The Mediterranean Sea just outside. Balcony view from the double room. Just around the corner is the Anthony Quinn beach, it was very steep down here and it started to rain so we stopped here. 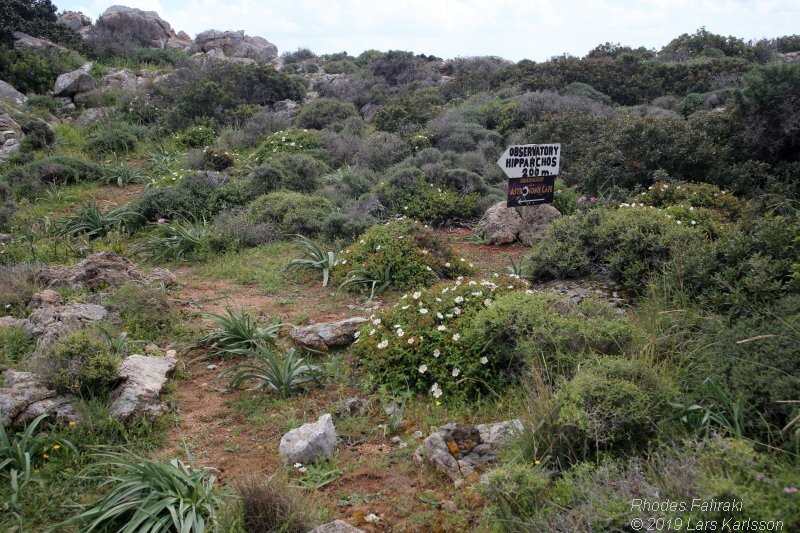 Back to the observatory and we said goodbye to Stergos and his wife and started our journey back home to Rhodes Town. 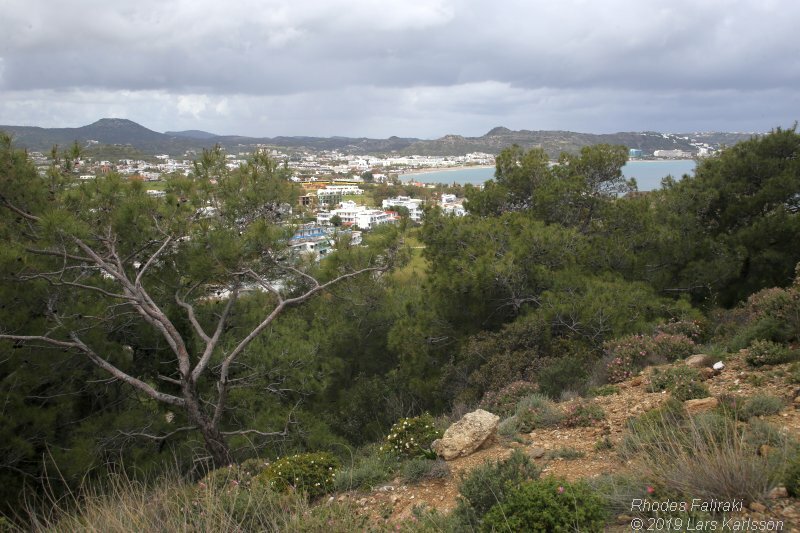 On the way back we walked out on the hill's ridge to have a view of Faliraki. 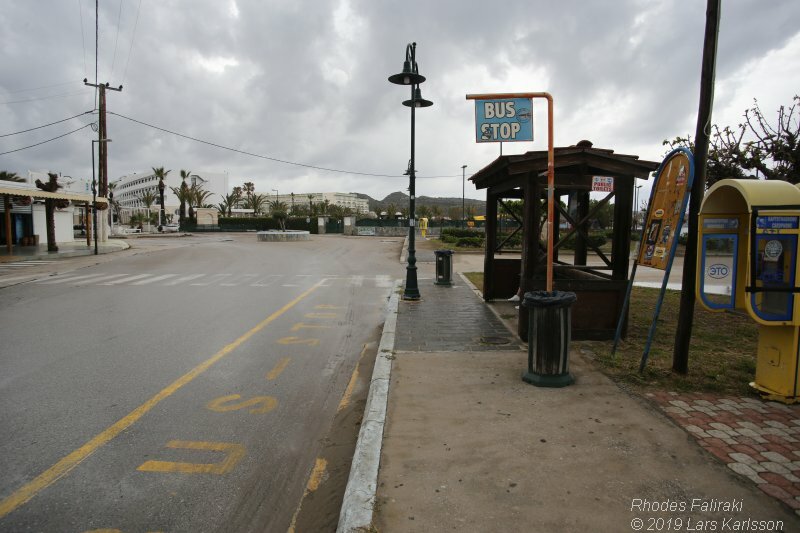 We took the road in the center of the photo up to the main road and its bus stop. 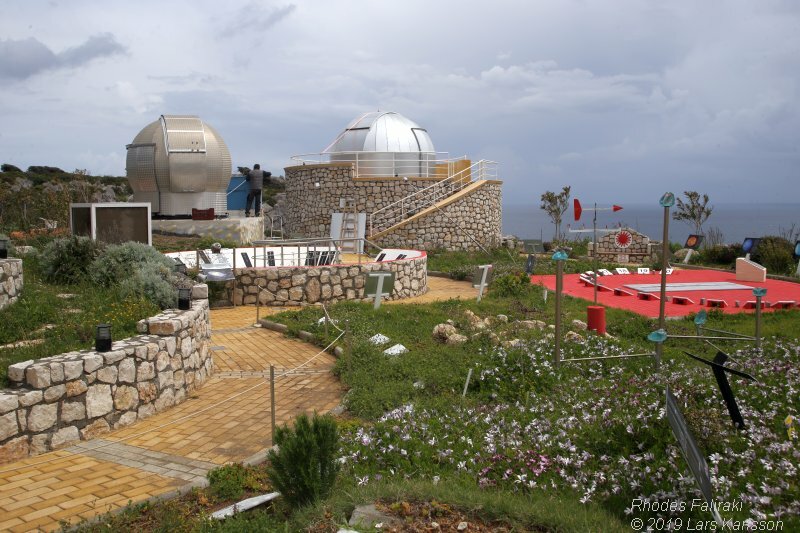 Both I and Gunilla felt this was a wonderful place, not only for astronomy observations. 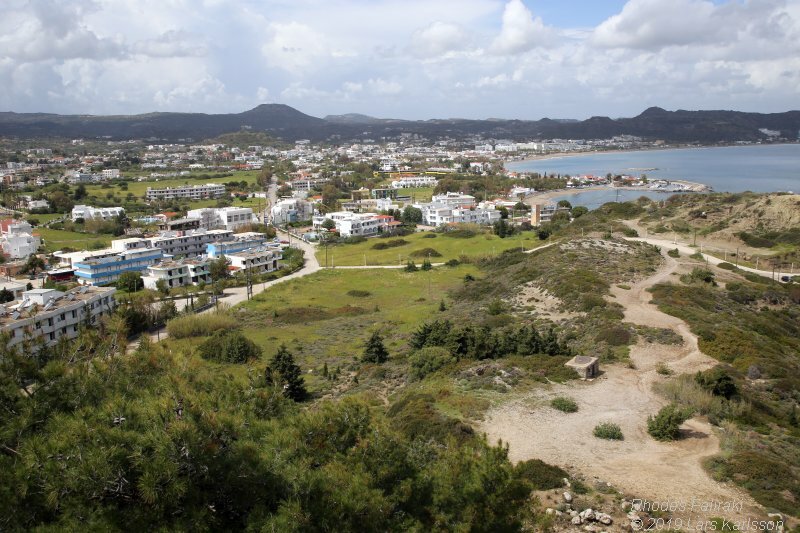 And as Stergos said, it's not the darkest place but a place where you can bring your family with you. 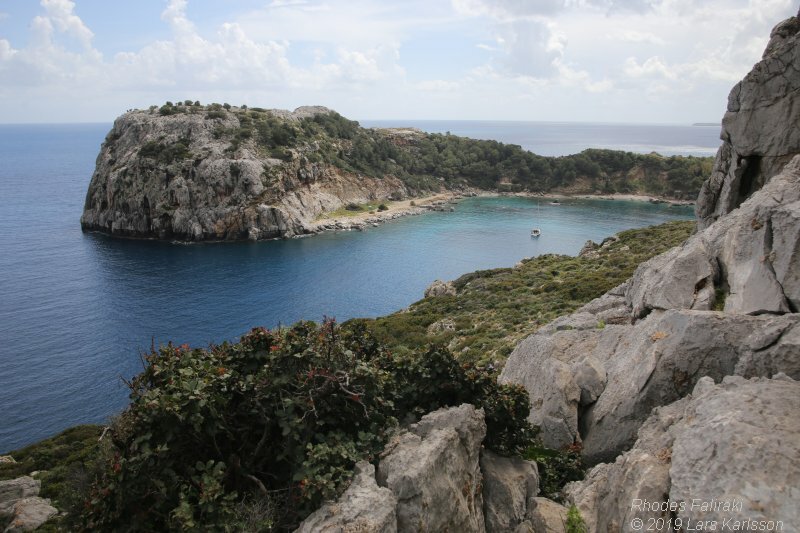 For us who live in Sweden it's both very easy and cheap to go to Rhodes. We hope to come down once more and live here for a week and doing astro photographing. There are big Dobson, Refractors, mounts, piers etc to rent, check his homepage below for details. Thanks for the guided tour ! Here you find the full Rhodes travel story.